One of the main topics of discussion in the past four presidential elections has been Bolsa Família, the conditional cash-transfer program created in 2003 by the Workers’ Party. Bolsa Família came about after the unification of several programs elaborated by the previous Social Democracy Party administration. 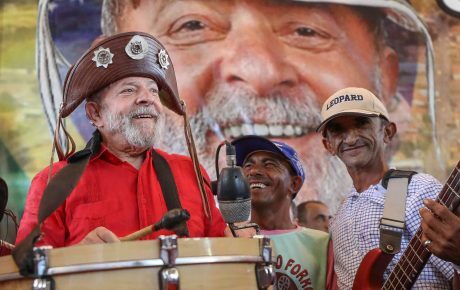 Over the years, the program became the biggest political symbol of former president Lula and his party, while adversaries have been ambivalent toward it. 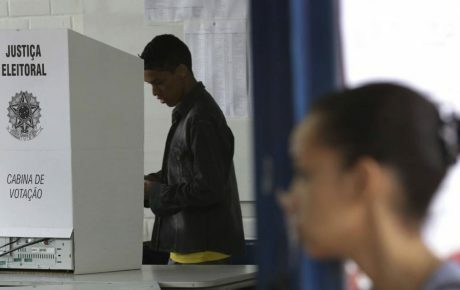 It is often criticized for creating dependent citizens, as “it gives the fish [to people], instead of teaching them how to catch fish for themselves.” However, the same critics have repeatedly promised to keep – and even increase – Bolsa Família in a bid to win votes. 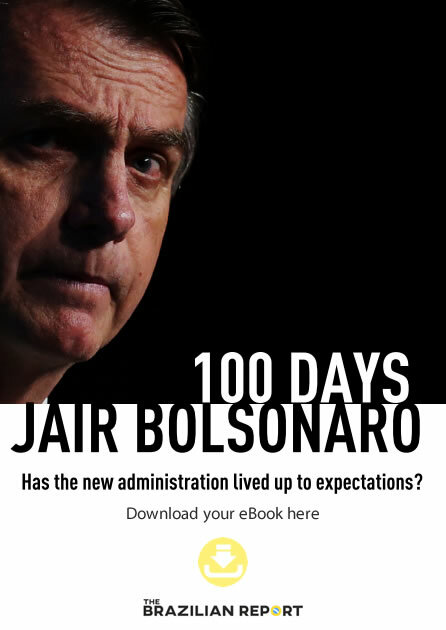 Jair Bolsonaro, the frontrunner in the 2018 presidential race, epitomizes that contradiction. In February 2011, he pondered the possibility of ending the program altogether, saying that “Bolsa Família is nothing more than taking money from those who produce and hand it to those who are lazy, so people would keep the status quo.” Now, Mr. Bolsonaro defends keeping it – and even creating a Christmas bonus, similar to what regular workers receive by law. Several academic studies have confirmed people’s intuition: the distribution of the program across the country has become a massive electoral asset for the Workers’ Party – proven by their scores in 2006, 2010, and 2014. Many point out that it is the reason for the northeast region – where the program is more widespread – becoming the party’s stronghold. Some would say that it is a rational decision by voters, made retrospectively: voters would be rewarding the group which developed public policies that are important for their lives. 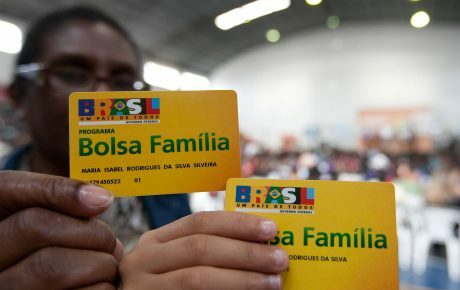 Others, however, see Bolsa Família as a disguised version of “vote-for-cash” schemes to benefit those in power. However, the Workers’ Party was ousted from the federal government in 2016, after Dilma Rousseff was impeached. Bolsa Família, on the other hand, has survived and still benefits 14 million families. The current electoral cycle is the first in which the program is still in place, but the Workers’ Party is not in government. This year’s campaign followed a similar pattern: the Workers’ Party repeated to the point of exhaustion that it created the program. 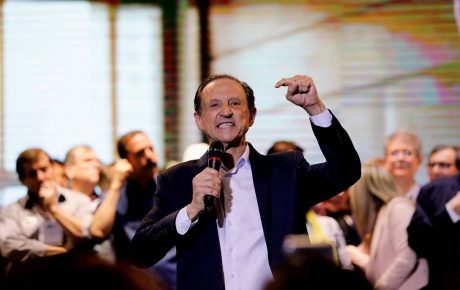 Its opponents – even those who are more pro-market – promised to keep it – and even increase the payment of Bolsa Família stipends. That begs the question: what’s the relation between the distribution of Bolsa Família and electoral results in 2018? Has the Workers’ Party once again benefited from it, even being outside of the federal administration? Does its strength in the Northeast relate to the penetration of the cash-transfer program? I have elaborated a simple model of linear regression. The analytic units are municipalities; the percentage of valid votes for the Workers’ Party in the first round is the dependent variable. 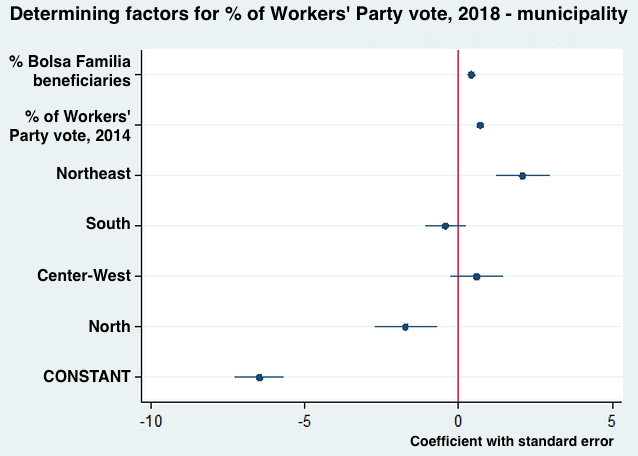 The independent variables are (a) the percentage of Bolsa Família beneficiaries; (b) the percentage of votes for the Workers’ Party in 2014’s first round; and (c) the macroregion indicators of the municipalities. The southeast region of the country was used as a reference. The data of Bolsa Família beneficiaries are approximate, due to gaps in municipal data. I assumed two voters per beneficiary family and divided that value by the total of registered voters per municipality. Evidently, these results must be observed with some caution – as the study doesn’t contain some control variables that could be important, such as GDP growth, which party runs the local government, etc. Besides, there are inherent difficulties in observational data. Estimates show that the higher the number of Bolsa Família beneficiaries, the higher the vote percentage for the Workers’ Party. So, even outside of the government, with no control over the federal budget or government agenda, the Workers’ Party still benefits electorally from the program. It is possible that a reciprocity mechanism – or the creation of a bond between party and voters – is at work here, which goes beyond an association between the program and the incumbent head of state. The party also fared better in the same regions where it had its best 2014 results (remembering that the results don’t mean, necessarily, that the Workers’ Party won in all of those cities). Bolsa Família will most likely continue to be extremely relevant for the electoral process in the future. 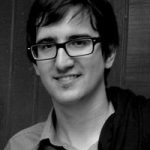 Assessing that importance is key to understanding Brazilian politics. Is Brazil’s Bolsa Família in jeopardy?